Just got the new firmware installed and trust me - Symbian Anna Rocks!!! I am feeling as if I have a whole new phone in my hand. Amazing page transitions, touch response and application loading. Even running multiple applications is too smooth. The new browser is the best thing in this firmware. It loads the pages faster and very user friendly now. There is an option for Intranet now in the Office folder. The universal search is alot faster and revamped. A message reader looks like a new addition available in the office folder. As soon as the firmware is installed, run the software update application in the applications menu. 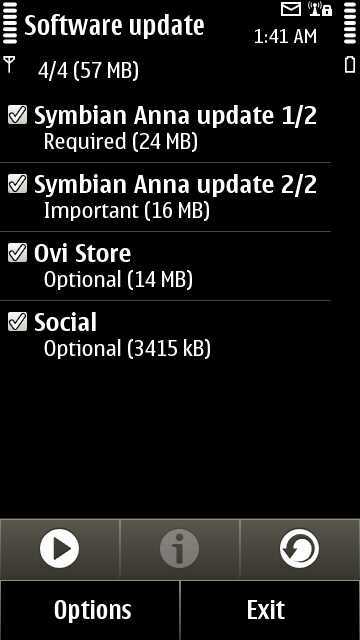 You will find four new updates available namely - Symbian Anna Update 1/2, Symbian Anna Update 2/2, Ovi Store & Social. The best part about this firmware is that everything that includes user data, previous applications and settings remain intact. You do not need to restore any data and all the applications work just as before without any change.